Amazon.com description: Product Description: Winner, 2007 Ludwig Fleck Prize given by the Society for Social Studies of Science (4S). and Awarded "Best Information Science Book 2006" by the American Society for Information Science and Technology (ASIS&T). The way we record knowledge, and the web of technical, formal, and social practices that surrounds it, inevitably affects the knowledge that we record. The ways we hold knowledge about the pastâin handwritten manuscripts, in printed books, in file folders, in databasesâshape the kind of stories we tell about that past. In this lively and erudite look at the relation of our information infrastructures to our information, Geoffrey Bowker examines how, over the past two hundred years, information technology has converged with the nature and production of scientific knowledge. His story weaves a path between the social and political work of creating an explicit, indexical memory for scienceâthe making of infrastructuresâand the variety of ways we continually reconfigure, lose, and regain the past. At a time when memory is so cheap and its recording is so protean, Bowker reminds us of the centrality of what and how we choose to forget. 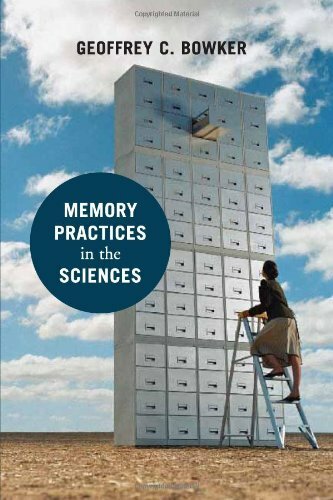 In Memory Practices in the Sciences he looks at three "memory epochs" of the nineteenth, twentieth, and twenty-first centuries and their particular reconstructions and reconfigurations of scientific knowledge. The nineteenth century's central science, geology, mapped both the social and the natural world into a single time package (despite apparent discontinuities), as, in a different way, did mid-twentieth-century cybernetics. Both, Bowker argues, packaged time in ways indexed by their information technologies to permit traffic between the social and natural worlds. Today's sciences of biodiversity, meanwhile, "database the world" in a way that excludes certain spaces, entities, and times. We use the tools of the present to look at the past, says Bowker; we project onto nature our modes of organizing our own affairs. About: Winner, 2007 Ludwig Fleck Prize given by the Society for Social Studies of Science (4S). About: How the way we hold knowledge about the past―in books, in file folders, in databases―affects the kind of stories we tell about the past.